Thank you, teachers, for another great school year. Thank you for standing at your doorway every morning, greeting each and every child with a welcoming smile. Thank you for setting your classroom up in a warm and inviting way, so that every child has the best learning experience. Thank you for starting off the day right, getting the kids excited about the day ahead with a fun opening activity, even when you didn’t get to have your morning coffee just yet. Thank you for going above and beyond when you are teaching our kids new skills, especially when the new skills require much practice and patience. Thank you for giving our little kids big dreams and the stepping stones needed to achieve those dreams. Thank you for encouraging them when they are trying their best, pushing them further when they have reached their goal, and redirecting them when they are not on the right path. Thank you for giving second chances, to give our kids a chance to do better or be better. 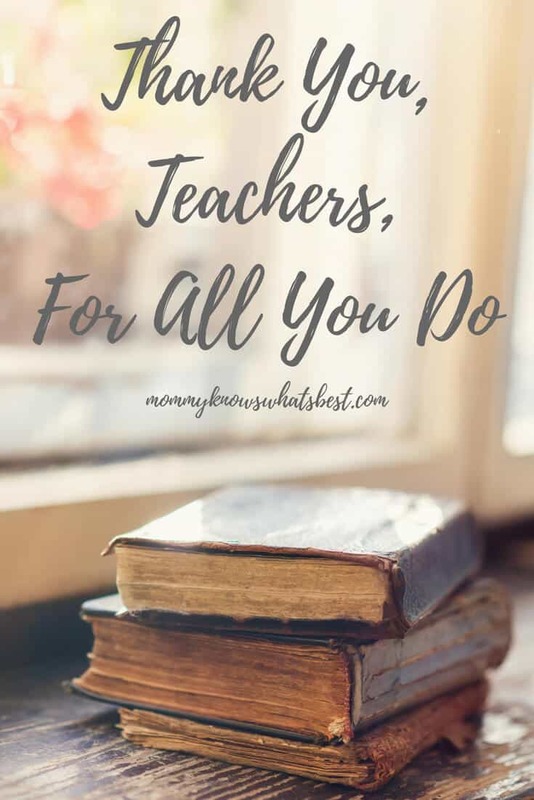 Thank you for spending your nights, your weekends, your holidays, trying to figure out your lesson plans and how to make everything work with an ever-changing curriculum. Thank you for instilling in our kids a love of reading, an awe of science, a respect for history, and an appreciation for math. Thank you for using your imaginations to give your lessons a chance to come to life in our kids’ minds. Thank you for continuing to teach the lesson, no matter how ‘boring’ it may have been to our kids. Thank you for helping our kids grow, both intellectually and socially. Thank you for taking an extra minute to talk with our children, to be a mentor, to give them a smile when it is most needed. Thank you for being positive role models, even on the toughest of days. Thank you for communicating with us parents, even though it may be difficult for you to reach out about some topics. Thank you for listening to our concerns when we reach out to you about our children. Thank you for giving us opportunities to work with our children at home, even though sometimes we don’t understand the math or dread having to put together another science project. Thank you for inspiring curiosity, keeping our kids excited about the world around them. Thank you for keeping our kids safe, shielding them from physical dangers and practicing drills in the middle of your lessons just in case. Thank you for working so hard though you may not be paid fairly. Thank you for spending your hard earned money on much needed supplies for our kids. Thank you for continuing to work at your job, even when society often seems to think so little of you. Thank you for staying strong, despite the news headlines. Thank you for staying when so many of us had to leave, to care for our families, to heal from an illness, to mourn a lost loved one, or to find other opportunities. Thank you for taking college classes, enduring long in-services, listening to podcasts, sitting in on meetings, and sweating out your latest evaluation. GET THIS AS A PRINTABLE TO SHARE WITH YOUR CHILD’S TEACHER IN MY FREE RESOURCE LIBRARY. Thank you for encouraging our kids to keep on learning during the summer, even though you know their minds are on swimming pools and video games. Thank you for working or taking classes through the summer so that you are ready to go back to school in the fall. Thank you for going back to your classrooms early, setting up a warm and welcoming environment for our kids. Thank you for standing by that doorway, year after year, waiting for a new group of young minds to inspire. Thank you, teachers, for all you do. 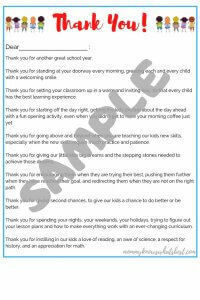 Want to Thank a Teacher? Thinking of a teacher who inspired you or your kids? Feel free to share this with them using one of the sharing buttons below! Leave a comment below telling me about your favorite teacher and how they made a positive impact on your life or the life of your child. Note: I know not all teachers are perfect, but man, the ones that are close to perfect are true gems that really go above and beyond in every way. With love, a former teacher. Previous Post: « How is a First Pregnancy Different from a Fourth Pregnancy? Great post Marissa! I think that we can both agree that teachers play a very difficult, yet important, role in children’s lives. Teachers provide kids with the tools needed to chase their dreams. Sure, learning our ABCs and 123s during class may not seem like much now, but that’s where it all started. 20 to 25 kids in one room staring at the chalkboard, being taught new things by someone who loved their job, despite the hardships that came with it. So, if I may Marissa, I would like to take the time to thank my teachers too. I thank every one of them for helping me get to where I am today. 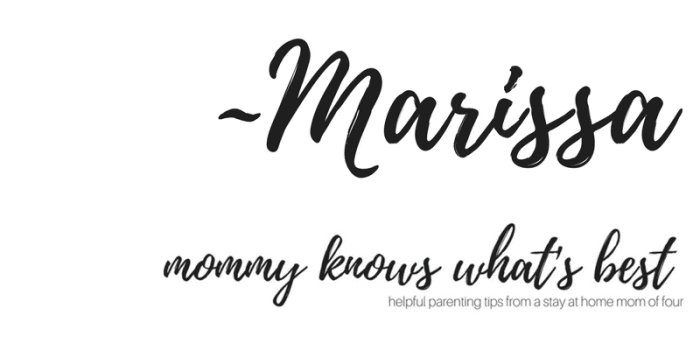 And I thank you, Marissa, for sharing this post!